I have mad garden envy of my friends who can garden. My friend Jonathan puts a lot of work into his, from hauling in pick-ups full of eye-watering not-quite-ready compost to determinedly watering the blank spot where his pipe vine used to be before his vacation until it re-sprouts. A former housemate, Emma, harvests greens and strawberries and radishes from a plot in a community garden (and blogs about it!). By contrast, my yard is a haven for whatever can survive the brutal Arizona heat and the adorable trampling of my housemate’s dogs. I have yet to figure out how bribe myself to work out there. The tentative promise of plump cherry tomatoes I ate from our backyard a kid just doesn’t do it. That’s what grocery stores are for, right? The fruits of my labor, or lack thereof, in my Tucson yard. My point is that different houses offer very different growing conditions. A watermelon seed falling in Jonathan’s little Eden may live to grow and produce fruit. I can spit all the seeds I want into my backyard, secure in the knowledge that they won’t stand a chance. Seeds can arrive not only through loving planting and tender care, but also via birds pooping, the wind blowing, or children playing. Ecologists call this process seed dispersal, as the seeds disperse themselves throughout your neighborhood (or the radius of the hardware store where you bought the packet). Here is another ecologist-y phrase to describe the collection of well-watered manicured gardens and the dandelion-spotted lots you see as you bike around a city: spatial variation. Means that in some yards roses grow better than dandelions (in Tucson it’s probably only if some human is maintaining their water supply), but in other yards the dandelions win. Spatial variation can promote biodiversity. You can see more species along a street with a range of landscaping preferences or conditions than you might in a neighborhood where everyone has picture-perfect Bermuda grass coating every inch of space. It is a common phenomenon in nature, too, one I observed in the Rocky Mountains on a recent vacation to Banff. Different trees and plants dominate the dry, windswept ridges than do the pockets in alpine meadows that remain swampy from melted snow. We can see with our own eyes that species have their own specific responses to environmental conditions. 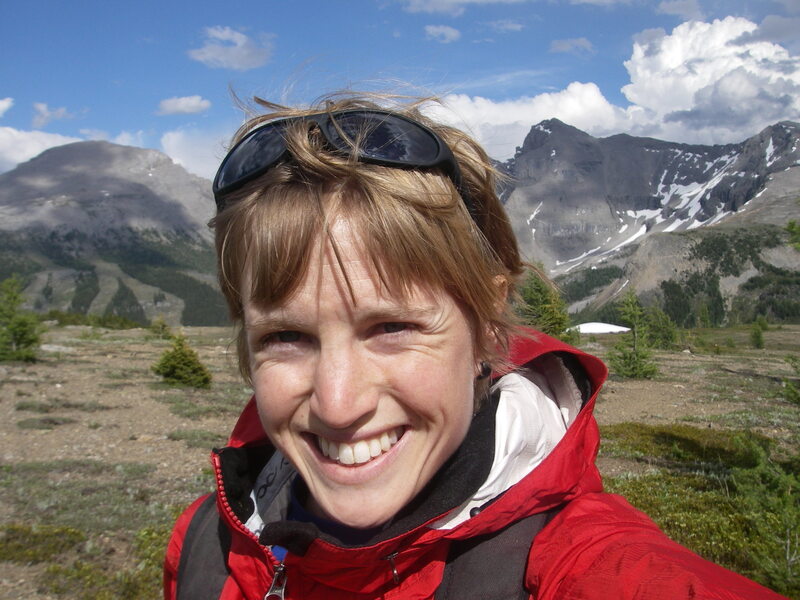 Hiking in Banff National Park, Alberta, Canada, I observed spatial variation in environmental conditions and levels of competition. 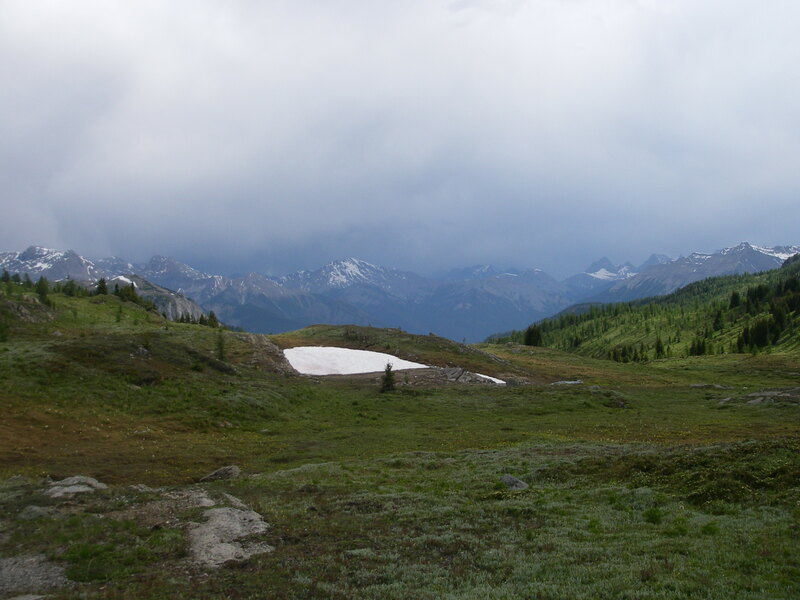 Snow pockets provide wet conditions, favoring species who compete well with plenty of moisture. But if that seems too obvious, environmental conditions are only part of what determines which species can coexist. The other major part is competition. As gardeners who start their delicate basil plants indoors know, if you sprinkle several seeds into each tiny pot, you’re almost sure to get at least one sprouting (that’s called bet hedging, and plants do it, too). But very likely, you will have a number of seedlings poking out their first shoots and leaves in every pot, as Emma’s April 21st photos show. As they grow larger, not all of them can survive. There is just not enough room, never mind nutrients, light, moisture, or other things plants need. Just as a University neighborhood (or gloomy sky like Seattle’s) may provide fertile grounds for coffee shops, yet a plethora of espresso joints ensures stiff competition and low profits, so do plants that find the choicest habitat have to battle contenders for space, for water, for light, for nitrogen, for pollinators, and the list goes on and on. (Check out Emma’s March 1 photo of a field of daffodils in Washington for an image of competition!) Environment and competition are obviously related and can determine local coexistence (and larger regional biodiversity). But how? Should a “good” environment be more diverse or less diverse than “poor” habitat? In introductory biology classes, we received this answer a maddening amount of the time: it depends. But that just leads to more questions, the most obvious being: it depends on what?! That’s where biology starts to get fun, but you’ll have to excuse me for a bit. The monsoon has started here in Tucson (raining in small patches, providing more spatial variation! ), and I have a garden to go imagine. Stay tuned. Why are there so many species and what are we going to do about it? There are an extraordinary number of life forms on the face of the earth. I mean, just staggering. Somewhere in the neighborhood of 2 million species have been described, depending on how species designations change as we get new information. That’s a hard number to wrap our heads around. Most of us have probably never seen 2 million somethings at one time (not counting bacteria and other stuff not visible to the naked eye). All those species have no business being alive and well! Didn’t Darwin’s theory of evolution suggest that when species compete, one of them wins and the other, well… tough luck? In Princeton biologists Rosemary and Peter Grant’s Galapagos study made famous in Jonathan Weiner’s Pullitzer winning The Beak of the Finch, people actually watched species converge and differentiate due to resource competition. So does that mean that each of these two million species is part of a neat little food chain, with each having their very own food, their very own kind of home, the predators that are only hunting them? Walk outside and look around. 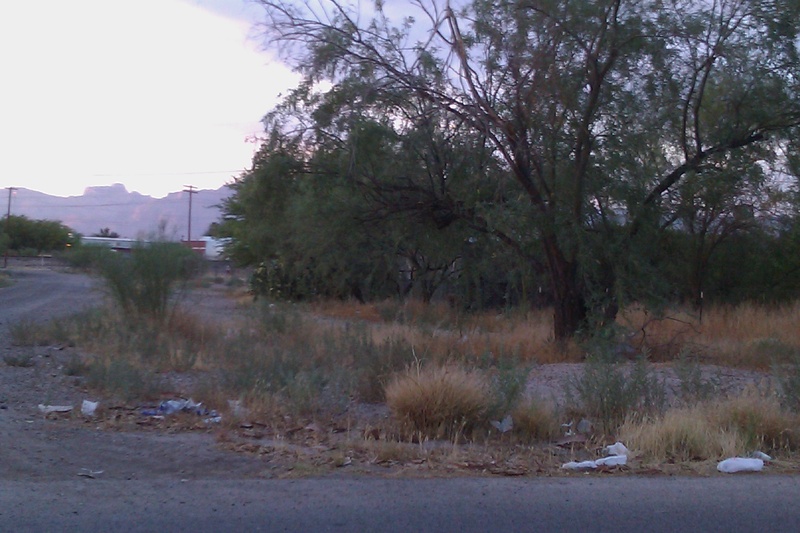 Along my street in Tucson, Arizona, there are plenty of empty lots, populated by weeds despite the brutally hot summers here – not many plants, and not many species, but certainly more than one. Rarely do I see a monoculture occur naturally. If you live near the Pennsylvania temperate forests, take a hike in the game lands and look at all the different trees and shrubs. Up in the Rocky Mountains, the fields of summer wildflowers are multicolored because of all the different species. The same holds true in Californian tidal pools, and in rainforests from Portland to Panama. It seems that a neat little picture of who lives where and eats what will not suffice to explain the world around us. Biodiversity is somehow maintained while species compete ferociously. A species’ ecological niche is not a tidy little box, but overlaps generously and unevenly with its competitors. How is this biodiversity was maintained? 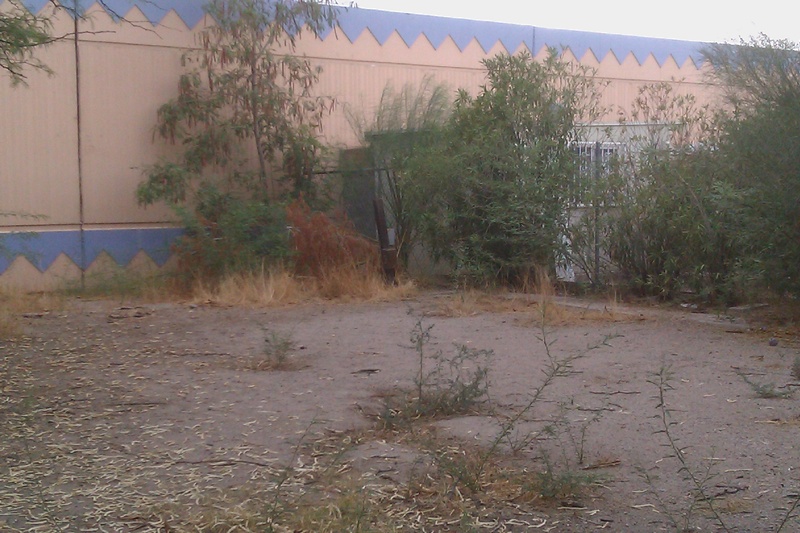 Why are those weeds coexisting in the empty lot next door? Or are they? Any why aren’t any petunias coexisting with them? I hope studying mechanisms of local coexistence will help us understand its loss and what that means. Species are vanishing faster than humans have ever experienced, and we are contributing to that. (Throughout the fossil record, but well before we were around, there have been 5 really big extinctions, of which the well known dinosaur extinction was one. We may be approaching a sixth.) Well-studied birds and mammals have been disappearing at roughly a species a year, and those are just the ones we know about. Thousands of square miles of Amazon rainforest is cleared every year, which, in such a lush and diverse ecosystem may be spelling extinction weekly for localized plants or beetles. It’s like we are playing a giant game of Jenga. We remove structural supports of this great towering network of ecosystems one by one, hoping it won’t collapse. Of course, if we keep going and keep going, eventually we would collapse, but are we really going to get to that point? Scientists are trying to answer that question: how much diversity is enough? That’s why I’m studying coexistence mechanisms in Peter Chesson’slab at the University of Arizona for my PhD. Members of our lab study the storage effect, relative nonlinear responses to competition, covariance of environment and competition, nonlinear competitive responses, and other fun mechanisms in variable environment ecological models. Still trying to figure out what that mouthful means? So am I.